Alexander Heffesse's Construction Site scented candle recalls the warm glow of roadside fires. 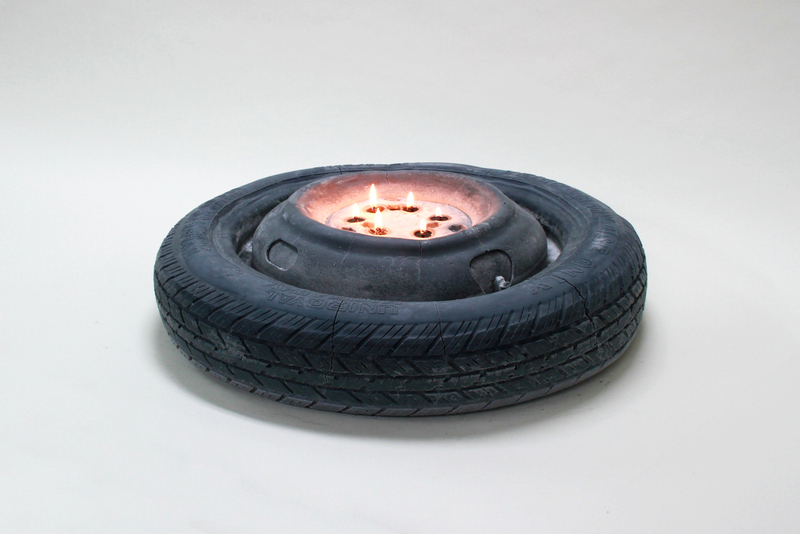 Light the wicks in this tire-shaped piece and be transported to the vacant lot of your dreams. You'll think twice before leaving your belongings behind at the beach this summer when you've got them immortalized in ceramic back at home thanks to Wyatt Little's Beach Stuff. The Leather Umbrella Hat by Yield Design promises to be your shelter in the storm. A hands-free rain solution made 100 percent from leather: What could go wrong? Gil Sunshine's Karnak Glazed Cups take industrial design to a different level—from the roof of your building to the roof of your mouth—with a series of ceramics caked in flashing roof cement. "Have you ever needed to put your head in a painting?" asks artist and Fort Makers cofounder Naomi Clark. Her Painting Hole promises to solves all your faceless-painting problems. "Enjoy your new streamlined painting life hole!" Fluttering pages got you down? Make that problem solve itself with Chiaozza's Paper Paperweights. Though they look like simple cannibalized scraps, there's a hidden tungsten ball tucked inside these weighty weights. Just in time for this weekend's NYCxDesign festivities, Kristen Wentrcek and Andrew Zebulon Williams of Wintercheck Factory have transformed their 3,000-square-foot Bed-Stuy studio space into a gallery. In a cheeky counterpoint to the myriad design events going on around the city, the one-night-only group show they're presenting is inspired by Skymall, the airborne catalog filled with quirky didn't-know-you-needed-it products. For the show, the design duo called on their artist and designer friends to reinterpreted the mission with a collection of one-off objects that definitely won't change your life. NYCxSkymall takes place on Friday, May 13, 2016, at Wintercheck Factory, 1241 Bedford Avenue, Brooklyn, New York.